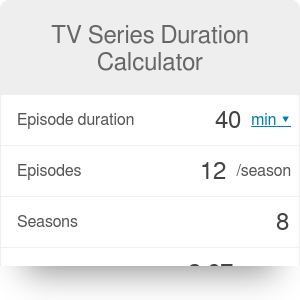 TV series duration tells you how many days or weeks it would take to watch your favorite TV series. TV shows have been hugely popular for many years and that probably won't change for a while. Few of us probably never watched titles such as Game of Thrones, Lost or, immortal, Friends so you clearly know why they're so addictive. If you're up-to-date with some great series you probably have its airing time written in your calendar or could recall it at any given time of day or nigh (or you simple know which day of a week you download it because it won't air on your local TV for another 2 years). Either way - once the TV series has become a significant part of our daily routine we hardly realize how much time we could be spending on watching them. The tool will tell you quickly how much time you could be spending on your favorite show. It should come very handy if you're just starting a series that premiered a few years back or want to watch again your favorite childhood show. 5 full days to catch up? Likely story. TV Series Duration can be embedded on your website to enrich the content you wrote and make it easier for your visitors to understand your message.